SWARTHMORE COLLEGE MADE HISTORY THIS YEAR. 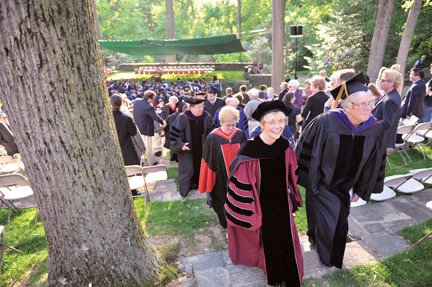 On May 8, a blustery spring day, the College inaugurated its 14th president. With 13 having gone before since 1865, this new president might have seemed to be just one among many. But this time, strong winds of change were blowing—literally, judging from the way the trees in the amphitheater were swaying in time to the wind’s celebratory song. On this day, after two Edwards, two Williams, and one each of Charles, Joseph, Frank, John, Courtney, Robert, Dorrie, David, and Alfred, Swarthmore College added the name Rebecca to its list of College presidents. Introduced by Board member Bennett Lorber ’64, the carefully constructed program included poetry readings by Professor of English Literature Nathalie Anderson, W.D. Ehrhart ’73, Daisy Fried ’89, Kinei Braithwaite ’08, and Rowan Ricardo Phillips ’96. Mark Loria ’08 performed three piano pieces, including one of his own compositions. 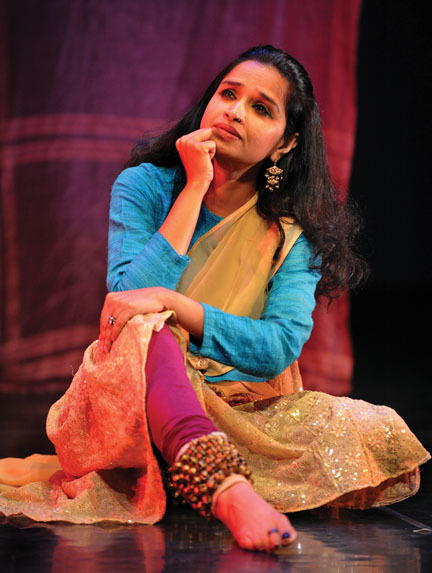 Assistant Professor of Dance Pallabi Chakravorty choreographed and performed a poem/song by Faiz Ahmad Faiz. Stephanie Duncan ’08 and Nick Forrest ’08 of Philadelphia’s Earth Speed Productions presented a theater piece that included musical performances by Anna Ghublikian ’08, created with Annie Fredrickson ’07 and Tiana Pyer-Pereira ’07. And Jumatatu Poe ’04 performed a curiously hilarious mime called “Flight Attendants” with dance partner Michele Tantoco. The evening was planned and coordinated by Sharon Friedler, Stephen Lang Professor of the Performing Arts, director of the Dance Program, and faculty adviser for foreign study, in honor of President Chopp, who, sitting front and center with her husband Fred Thibodeau, joined the rest of the audience in enthusiastic applause. AFTER AN OVERCAST DAWN with a threat of rain in the forecast, inauguration day brightened by lunchtime. Fluffy white clouds, driven by a stiff wind, scudded across an azure sky. Under a splendid tent near Sharples Dining Hall, on tables decorated with festive red and green flower arrangements, guests enjoyed a delicious lunch of local fare. 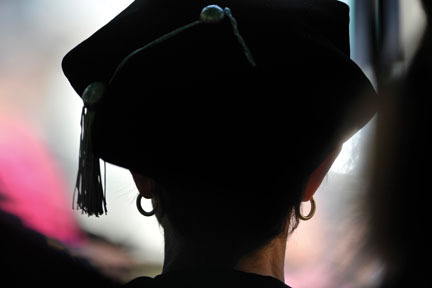 At 4 p.m., faculty members and invited delegates from other colleges began to assemble in Parrish Hall Commons—converted to a “robing room” for the occasion. 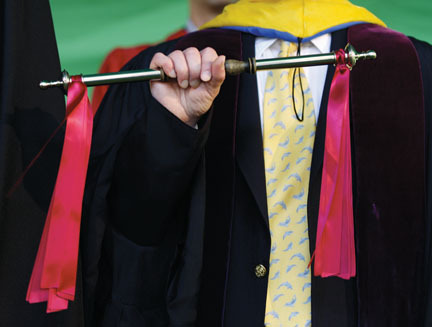 Long clothes racks placed around the room were laden with academic robes and brightly colored hoods. 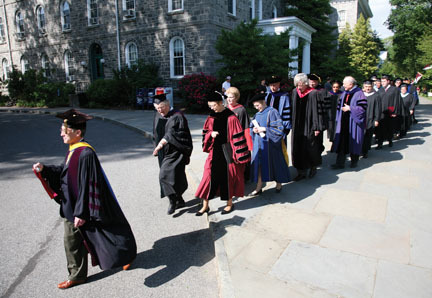 Swarthmore faculty members, each paired with a representative from another academic institution, could be heard murmuring “I can’t find my delegate,” or “Has anyone seen my robe?” or “Should I do hat or no hat?” Others chatted excitedly, and hugs were exchanged between colleagues from various institutions. Robes were donned. Friends helped each other arrange caps and hoods. When all were seated, Mather announced a moment of silence. Then, Vice President for College and Community Relations Maurice Eldridge read William Wordsworth’s poem “The World is Too Much With Us”—“Getting and spending, we lay waste our powers; / Little we see in Nature that is ours; / We have given our hearts away, a sordid boon!”— recalling man’s centuries-long disrespect for nature and his fellow men and reminding listeners of the theme of this inauguration. Throughout the ceremony, the sun flirted with passing clouds and cast dancing rays into the amphitheater. Towering tulip poplars provided steady background accompaniment, whispering and swaying, dipping and bowing, played by a rushing wind that occasionally found its way into the loud speakers to add its own drum roll to the solemnity of the moment. And when President Chopp stood to speak, the sun, as if on cue, emerged from behind a cloud and filled the amphitheater with a radiance that seemed perfectly appropriate to the moment. 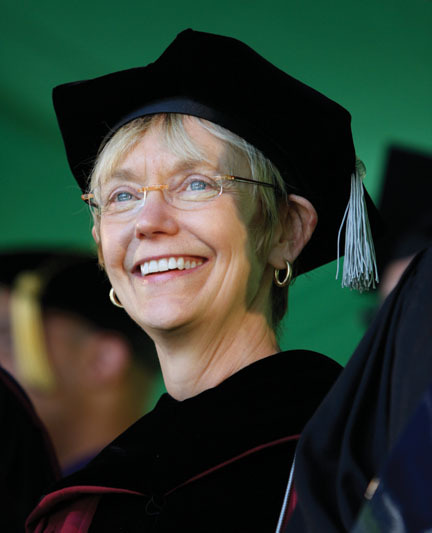 In her address “Hope in an Age of Clamor,” Chopp focused on the College’s responsibility to educate its community members and, through them, the rest of the world to heal and preserve humanity’s relationship to Nature and to itself. 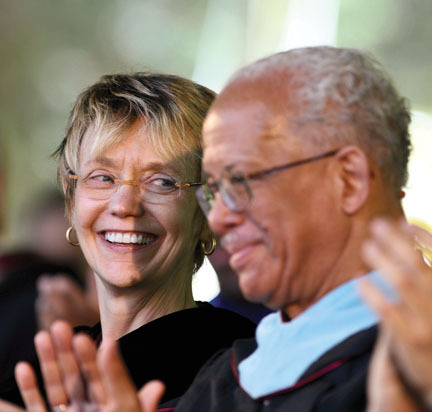 “As I formally assume the presidency of Swarthmore, I believe that we must, as has been tradition throughout our history, continue to educate in a way that a setting-aright remains possible. We have to ask ourselves: How must the world be set anew? How must the world be set aright? 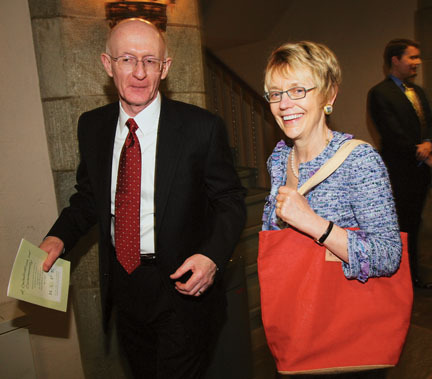 President Rebecca Chopp and her husband Fred Thibodeaux. “We must educate to set anew and set aright our relationship to the earth, to our climate, to the web of all existence. Under this canopy of trees, can there be any doubt that we must do all we can to sustain the beauty of this good earth; together, in this collection, can there be any question that we must care for one another and, equally important, for those who live without our resources? …. “We must educate to set aright civic discourse. In recent months, we have witnessed just how uncivil that discourse can become in both national and local arenas; how demeaning and cruel words can be, whether uttered in Congress, cyberspace, town halls, or on playgrounds …. We must educate people to listen to others whose views differ from their own, to deliberate and collaborate, to embrace complexity, and to seek consensus ….” Chopp said. Dance performance during inauguration weekend. 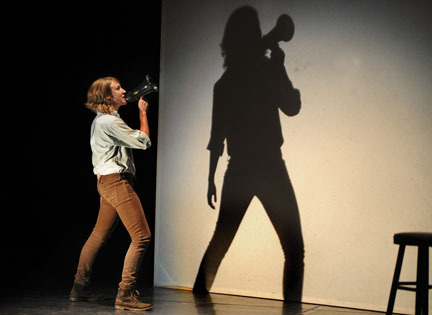 Arts performance during inauguration weekend. 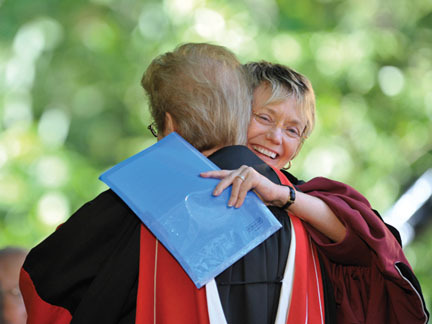 President Rebecca Chopp receives a hug from a friend following her inauguration as Swarthmore College's 14th president. President Rebecca Chopp and President of the Board of Manager Barbara Mathers lead the procession out of the amphitheater after the inauguration.